There will be partying in the streets of Bathurst, NB this week as fans celebrate the first Memorial Cup championship for their Acadie-Bathurst Titan. The Titan beat the Regina Pats on Sunday evening to win the 100th Mastercard Memorial Cup. It wasn’t long ago, though, that the last champion, the Windsor Spitfires, were celebrating all things junior hockey. Just one year ago, the City of Windsor joined the Spitfires in bringing one of junior hockey’s biggest events to the Rose City. In May 2016, the Spitfires announced that they would be hosting the 2017 Mastercard Memorial Cup. It was the first time they had hosted since 1981 when the tournament was at the now-defunct Windsor Arena. The team had played in three Memorial Cups since then – 1988 (lost in final to Medicine Hat), 2009 (won in Rimouski) and 2010 (won in Brandon). Hosting it, though, was a different beast. The Spitfires and their fans had waited a long time for this and they weren’t letting the chance slip away. The City of Windsor went all-out away from the WFCU Centre, ensuring teams and fans had the red-carpet treatment. When you’re injecting tens-of-thousands of people into a region for more than a few days, it’s a perfect chance to show what the area has to offer. “It’s about strengthening our city, and all that it has to offer… and offer a positive conversation about our community,” said Windsor Mayor Drew Dilkens at the time. “Sports tourism is an integral part of this strategy, one that is having a solidly positive impact on the reputation we are building on the world stage. Fans of the three visiting teams – the Erie Otters, Seattle Thunderbirds and Saint John Sea Dogs – joined other CHL and general hockey fans for this prestigious event. They came by planes, trains and automobiles with the Rose City as their destination. For some, it was a last-minute decision, but for others, it was a long-term commitment. One of the fans we talked to during the tournament, Aleah Quinlan, was from the Seattle area. She and her mother were long-time Thunderbirds fans and had planned on going to Windsor for months. “We decided (to come) in November (2016),” Quinlan said during the tournament. This was a golden opportunity for the City of Windsor, as well as the Essex County region, to show the world what they had to offer. Fans come to not only watch great hockey but to experience something new and exciting. They embrace the experience like no other. From eating in local restaurants to having a stroll along the Detroit River or Point Pelee beaches, this was a chance to showcase the best we had to offer. 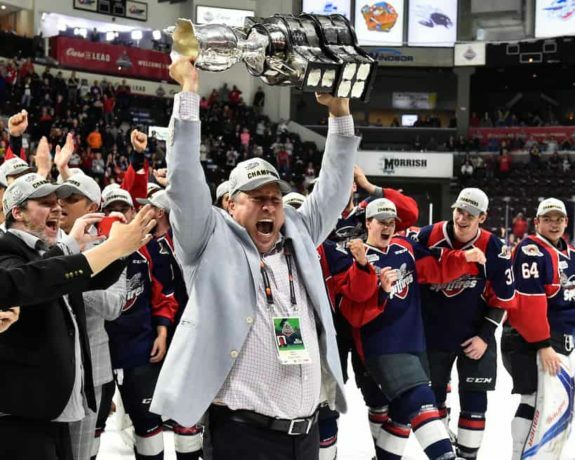 None of this celebration could have happened, however, without the work of Spitfires general manager Warren Rychel. While the off-ice activities were being planned from the start, Rychel was busy putting together a team that would make the city proud. The process started in late June when Rychel dealt defenceman Kyle Auger and picks to the Barrie Colts for Finnish import Julius Nattinen. The veteran came to the Spitfires with offensive flair and some experience, which would be crucial to the roster. Rychel wasn’t done there. He brought in veteran Jeremiah Addison from the Ottawa 67s for conditional picks, defenceman Sean Day from the Mississauga Steelheads for several picks and forward Graham Knott from the Niagara Ice Dogs for several picks. That was all before Christmas, too. After Christmas, Rychel dealt captain Patrick Sanvido to the Sudbury Wolves in a very difficult deal. Sanvido was a long-time Spitfire and one of those guys you wanted to build around as he was loved by everyone. Before the deadline hit, Rychel watched teams like the Otters and London Knights load up for a run. Fans got anxious and Rychel did his thing. He brought in star forward Jeremy Bracco from the Kitchener Rangers for veterans Cole Carter and Andrew Burns, plus picks. Rychel then brought in speedy forward Adam Laishram from the Hamilton Bulldogs for picks. Nobody could say Rychel wasn’t swinging for the fences. This was a veteran roster that was built to win. The only issue was several others teams were built to win, too. The OHL’s Western Conference has never been an easy one to win. Teams like the Knights, Otters and Sault Ste. Marie Greyhounds, to name a few, are always hot on the trail of the title. While the Spitfires were Memorial Cup hosts, they knew it would be difficult once the playoffs hit. In the first round, the fifth-seeded Spitfires faced off against the fourth-seeded Knights. While the Spitfires finished with 41 wins and 90 points, the Knights had 46 wins and 99 points. It was one of the toughest finishes the conference, and the league, had ever seen with five teams having 90 points or more. 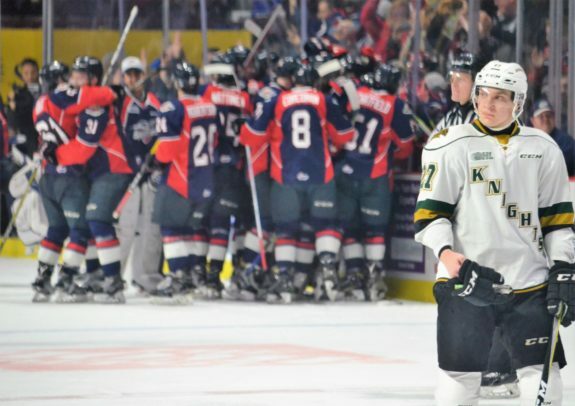 The Spitfires gave the Knights all they could handle, though, and even had a 3-1 series lead heading into Game 5. That’s where the Knights’ experience took over, though. As defending Memorial Cup champions, they took it to the Spitfires, tying the series up at 3-3. Even Game 7 was tied in the third period. Unfortunately for the Spitfires, a late power play goal for the Knights sealed the deal. The Knights celebrated advancing to play Otters while the Spitfires had to figure out a Plan B while they waited for the tournament to start. The Spitfires’ coaches and management put together a training plan and put the team through a tough six weeks. These players were hungry and eager to prove that they were the real deal. As the tournament started, nerves were obvious, both from fans and the team. It was quickly diminished, though, when two trade titans, Bracco and Addison, gave the Spitfires a 2-0 lead in the opener. Add a third-period goal from veteran Aaron Luchuk and the Spitfires grabbed the 3-2 win over the QMJHL Champion Sea Dogs. 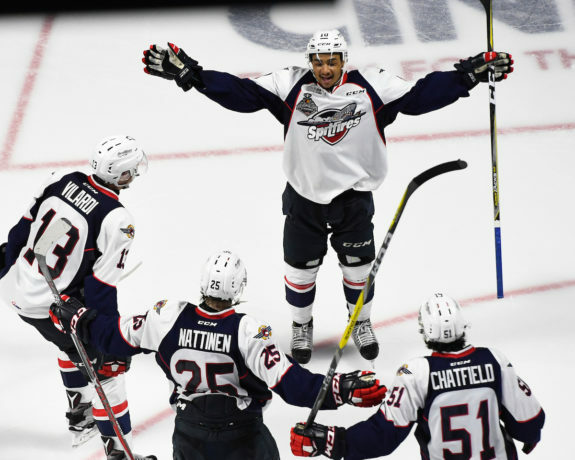 Two nights later, the Spitfires scored three goals in just over 30 seconds en route to a 7-1 win over the WHL Champion Thunderbirds. All Windsor would have to do is beat the Otters on the final day to go straight to the tournament final. Two first-period goals, followed by the insurance goal late in the third period, gave Addison the hat-trick and the Spitfires a massive 4-2 win over the Otters. The Spitfires were outshot 35-19 but were saved by Addison and the heroics of goaltender Michael DiPietro. It was the performance the Spitfires had hoped to get from Addison when they brought him on in August. 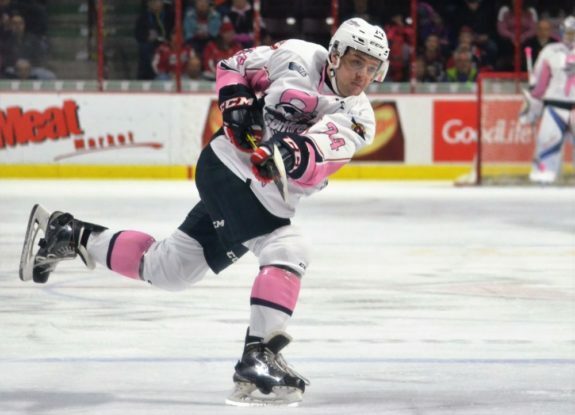 The Otters beat the Sea Dogs in the semi-final, setting up a wild Memorial Cup title game. As a neutral fan, you couldn’t have asked for much more. As a Spitfires or Otters fan, this was both exhilarating and exhausting. An early Bracco goal gave the Spitfires a 1-0 first-period lead. Dylan Strome quickly responded for the Otters and he was followed by Warren Foegele in the second period. Just like that, it’s 2-1 Otters. Before the PA announcer could give the details on Foegele’s goal, Logan Stanley tied it up for the Spitfires. Both teams would exchange one more goal before the period ended. A tie game heading to the third period of the Memorial Cup final; the tension was slightly high. Never count that Spitfires’ team out, though. Just over five minutes into the third, Luchuk took a pass in the slot from Bracco and beat goaltender Troy Timpano high glove side, giving the Spits the 4-3 lead. The WFCU Centre was shaking and rightfully so. The packed house was 15 minutes away from seeing their dream realized – a Spitfires’ Memorial Cup win on home ice. The fans counted down, the buzzer sounded and the Spitfires had their third Memorial Cup title in nine years. While the Spitfires lost to a strong Knights team in the first round, they showed Canada they were the real deal throughout the tournament. From the moment the Memorial Cup arrived at Dieppe Gardens to when the Spitfires’ lifted the trophy on stage at the Windsor Riverfront Festival Plaza to celebrate the win, the fans and the city embraced everything about the off-ice activities. They lined the streets on a warm late-May evening as the Spitfires paraded the trophy down Ouellette Ave.
After a tough battle on the ice, being able to let loose was something everyone cherished. Graduating forward Cristiano DiGiacinto said at the time that winning and celebrating with the fans was a pretty ideal ending to his Windsor story. “To bring this championship home for them was something I couldn’t have asked. I couldn’t have written this,” he said during the parade. According to CBC, after the tournament, Tourism Windsor Essex Pelee Island CEO Gordon Orr had estimated that fans coming into Windsor generated tens-of-million dollars into the local economy. “We know first-hand when people come and experience our area for the first time, they go back to their respective cities and their families and friends and they tell their story about a positive, memorable experience they had in Windsor, and that’s going to be the best marketing of all,” he told CBC. After winning the 2009 Memorial Cup, the Spitfires were considered a strong candidate to host the 2011 Memorial Cup. They had the roster and they clearly had the experience. Instead, the Steelheads were awarded the tournament and the rest is history. The City of Windsor got their chance, though, and this was an event to be thankful for. On the ice, there wasn’t much more Rychel and his staff could have done to prepare the club. Winning the OHL title would have been great but they ran into stiff competition in a historic season for the OHL. Performing well in the tournament was what the team needed. Winning it was icing on the cake. It showed all the efforts were worth it. Off the ice, the city shined, fans had a blast and businesses flourished. When you get rave reviews from people across our great continent, you’re doing something right. It was a chance to show what our city has and we passed with flying colours. Windsor may not host the tournament again for decades as it goes on a cycle – the OHL hosts every three seasons, just like the WHL and QMJHL. With several other cities in the OHL being deserving, Windsor has moved to the bottom of the priority list. What unfolded, though, was nothing short of phenomenal. It was a potentially once-in-a-generation opportunity. The Spitfires are now in a full rebuild mode with much of the championship roster either having moved onto new OHL teams or graduated to the pros or college hockey. If you ever get the chance to attend the tournament, whether it’s for a day or the entire week, embrace the experience. This is what junior hockey is all about!